Media in Canadian society during World War II largely covered the subject of war, which translated through all forms of media, including comic books. The 21st issue of Commando Comics, a comic book from the Canadian Whites collection published during World War II, displays the prominence of war-related media. Additionally, much of the content in this issue is regarding race, particularly portraying Japanese people as the antagonist of the stories. What this exhibit will discuss is that this issue 21 of Commando Comics reflects the general societal view of Japanese people as “the enemy” during World War II, as well as representing Japanese people in a negative light in order to shape public opinions of Japanese people. This reflection of society within the comic is evident through the consistent pattern of Japanese people being the antagonists of the stories, as well as the physical content in the issue portraying Japanese people in a stereotypical, offensive way, such as referring to them in derogatory terms. The importance of this is that this purposeful shaping of public opinion resulted in mistreatment and discrimination against Japanese-Canadians that would continue for decades following World War II. This issue of Commando Comics displays the overt racism prevalent at the time it was written, through the way Japanese Characters are referred to and the stereotypical way in which they speak and act. The most prominent way this is evident in the comic is the use of the word “Japs” to refer to Japanese people. In the story “Doc Stearne”, the antagonists, which are Japanese soldiers, are referred to as “Japs” six time in the first three pages of the story(Dexter, 44-46). This excessive use of the offensive term confirms that not only is the overall tone towards the Japanese strongly negative, but also that the author of the story, Fred Kelly, did this very deliberately; It is a very strongly offensive term, and the repetition serves to emphasize this. As for the word “Japs”, it is a crude, shortened version of a word encompassing an entire race, showing direct disrespect and outright hatred for the race as a whole, through refusal to use proper terminology. This is significant, as the Canadian Whites, the group of WWII comic books in Canada, were popular and widely-read. 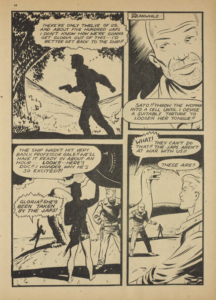 Therefore, the messages and ideals that the stories in issue 21 of Commando Comics presented were being spread throughout Canada, cementing a very anti-Japan mentality into Canadian society. Another aspect of the physical comic book and its illustrations that demonstrate the same anti-Japan sentiment is that the antagonists of the stories sometimes are not explicitly identified as Japanese, but are drawn to look Asian, leading the reader to believe that these characters are also Japanese. Additionally, in the Doc Stearne story, Japanese writing characters are presented in a speech bubble above a Japanese character’s head. This is significant, as the Japanese character not speaking English creates even more of a barrier between Japanese people and the comic’s English-speaking readers, leading to misunderstanding and discrimination. The visual portrayal of antagonists as Asian in the stories and the use of a language barrier make it very clear that these characters are Japanese, and therefore the fact that the antagonists of many of the stories are Japanese further confirms the idea of Japanese people being the ultimate enemy. The significance of this negative portrayal of Japanese people lies in the fact that this was done deliberately in comic books in order to sway public opinion regarding Japanese people, and therefore create a country united against the enemy of Japan. In a journal article published in the Pacific Historical Review called “This is Our Enemy”, the way in which war and media are intertwined is discussed: “The comics are drumming up a lot of hate for the enemy, but usually for the wrong reasons—frequently fantastic ones (mad Jap scientists, etc.). Why not use the real reasons—they’re plenty worthy of hate!’’ (Hirsch, 54) This quote demonstrates the anti-Japan mentality that existed in the Western world during World War 2, as the speaker clearly has many reasons to hate Japan. Additionally, they are not concerned about public opinion being swayed by comic books, but encourage hate towards Japan. This supports the claim that the negative portrayal of the Japanese in comic books swayed public opinion about the race as a whole, as well as that this was done deliberately by comic book writers. Race is a prominent theme throughout the entirety of issue 21 of Commando Comics, as the majority of the protagonists of the stories are white Canadians and most of the antagonists of the stories are either Japanese or unspecified Asian. For example, in the story “Doc Stearne”, Doc Stearne, the white male protagonist, fights a group of Japanese kamikaze corps. Most of the stories in this issue that feature Japanese antagonists present them in a very negative and violent light. For example, in the story “Ruff and Reddy”, the antagonists, a group of presumably Japanese men are very violent, kidnapping the protagonist as well as highjacking the protagonist’s plane. (Dexter, 10-15) The presentation of Japanese people as violent and as the enemy, not only paints all Japanese people, and even all Asian people as bad people, but leads the public to believe this rhetoric and act accordingly. Canada Wartime Information Board. Propaganda poster. Don’t depend on Hara-Kiri – Finish the Job. Canadian War Museum. 1945. Public Domain. World War 2, which was that Japanese Canadians were innocent of the war crimes of the Japanese. The negative, antagonistic way in which the Japanese are portrayed in issue 21 of Commando Comics greatly contrasts this reality. This reveals that comic book writers were deliberately using overly negative portrayals of Japanese people to negate the reality of their innocence. The distorted portrayal of Japanese people as the ultimate enemy in this comic led to massive ramifications for Japanese people in Canada at the time. Additionally, the image displayed in this section demonstrates the way in which media was used to cement Japanese people as the enemy, as it shows two white English Canadians standing over the body of a Japanese dragon they killed. Even in media like posters, Japanese people were deliberately being presented as the enemy that was to be destroyed. Being that this is a propaganda poster, the presentation of the Japanese as the enemy, signified by a Japanese dragon, is significant; Japanese people were deliberately displayed as the enemy in media, such as propaganda posters, in order to shape an anti-Japan sentiment throughout Canadian society. The portrayal of Japanese people as the enemy in WWII comic book issues had lasting ramifications for Japanese Canadians for decades to come, impacting the lives of decades of Japanese Canadians. As previously discussed, the portrayal of Japanese people in issue 21 of Commando Comics is very negative, labelling them as the enemy in many stories, and this portrayal of the entire race led to the public opinion of the Japanese to become increasingly negative. The years surrounding World War 2 held a large amount of discrimination for Japanese Canadians; Japanese people were constantly being shown as awful enemies, leading society to view Japanese Canadians in the same light, which then led to incredible discrimination and mistreatment. In the Canadian Historical Association booklet “Ethnic Minorities During Two World Wars”, this discrimination is discussed: “The day after the destruction of Pearl Harbour, The Royal Canadian Navy confiscated 1300 fishing boats, for fear that their Japanese Canadian owners would use them to guide an invasion force[…]” (Thompson, 16) This quotation directly outlines the discrimination against Japanese Canadians due to the war crimes of the Japanese, highlighting the ingrained anti-Japan sentiment present in society during World War II. Additionally, the majority of this discrimination is a result of the public opinions of Japanese people and the need to please English Canadians, as well as calm their fears about Japanese Canadians, even if these fears are unjustified. Issue 21 of Commando Comics displays clearly the use of media to reflect public opinion in opposition of Japanese people. The significance of the large role media had on public opinion is the impact that these opinions had on Japanese Canadians. Another excerpt from the booklet “Ethnic Minorities During Two World Wars” states that “[…] Japan’s rapid series of military successes inspired a public hysteria which in turn forced the federal cabinet to implement policies of rapidly escalating severity.” (Thompson, 16) The term “public hysteria” is significant, as this shows that public opinion had a direct impact on the treatment of certain groups. Fred Kelly. Page from “Doc Stearne”. Commando Comics, No. 21, 1946, p. 45. Bell Features Collection. suitable torture to loosen her tongue.” (Dexter, 45) This page is included on the left, as this displays the clear anti-Japan sentiment present in much of the comic book. An additional story in the comic book that clearly displays the way in which the Japanese were viewed in society at the time is the story “Salty Lane”, in which a white Canadian convoy is destroyed by unspecified Asian soldiers. Not only are both of these examples presenting the Japanese, and even encompassing all Asian people in a very violent light through violent actions, but also presents the people themselves as evil. The damaging way that comic books shaped public opinion of Japanese people, through the generalization of Japanese people as evil and the violent acts they commit, directly affected the way that Japanese Canadians in society as a whole were treated. This is also displayed directly by the included page, as it shows the strong anti-Japan sentiment present in society. The damaging effects of the discrimination against Japanese Canadians, like the confiscation of Japanese Canadian property, are therefore a lasting result of World War II comic portrayals of the Japanese. Throughout issue 21 of Commando Comics, Japanese characters are presented in a stereotypical and offensive light, through the use of derogatory terms like “Japs”, and the Japanese characters are almost always the enemy in the stories. This clear distortion of Japanese people as a whole had a direct impact on public attitude towards the Japanese in Canada, shown through the fact that public hysteria directly led to the mistreatment of Japanese Canadians. The portrayal of Japanese people in this comic book was not only deliberately used by comic book writers to shape public opinion, but it therefore also shaped the way in which Japanese people were subsequently treated, revealing the extent of power comic books have over society. 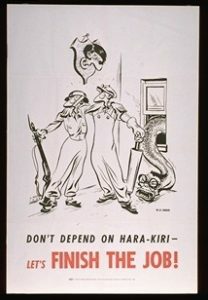 Aslin, H. Don’t Depend on Hara-Kiri – Get The Job Done! 1946, Canadian War Museum, www.warmuseum.ca/cwm/exhibitions/propaganda/poster19_e.shtml. Hirsch, Paul. “‘This Is Our Enemy’: The Writers’ War Board and Representations of Race in Comic Books, 1942-1945.” Pacific Historical Review, vol. 83, no. 3, Aug. 2014, pp. 448– 86. JSTOR, doi:10.1525/phr.2014.83.3.448. Kelly, Fred. Commando Comics, No. 21, 1946. Bell Features Collection, Library and Archives Canada. http://data2.collectionscanada.gc.ca/e/e447/e011166550.pdf. Kelly, Fred (a). “Doc Stearne”. Commando Comics, no. 21, 1946, pp. 44-50. Bell Features Collection, Library and Archives Canada. http://data2.collectionscanada.gc.ca/e/e447/e011166550.pdf. Sunahara, Ann Gomer. The Politics of Racism: the Uprooting of Japanese Canadians during the Second World War. Lorimer, 1981. http://www.japanesecanadianhistory.ca/Politics_of_Racism.pdf. Thompson, John Herd. Ethnic Minorities During Two World Wars. Canadian Historical Association, 1991. http://www.collectionscanada.gc.ca/obj/008004/f2/E-19_en.pdf.